Easily scale your cloud data warehouse up or down via the console or REST API to meet the needs of your business while adjusting compute and storage resources to meet performance requirements and optimize costs. 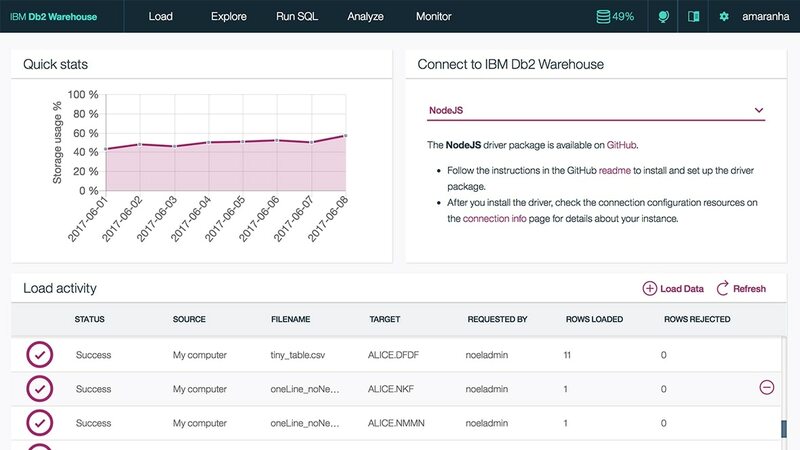 Your cloud data warehouse instance is managed, monitored, encrypted and backed-up by IBM, so you can focus on data analysis instead of administration. With IBM BLU Acceleration, you will be able to take advantage of a collection of key technologies developed by IBM Research. These include in-memory processing for faster access to data, actionable compression which allows querying of data without decompression, and data skipping that only pulls from disk the data required to satisfy the query. All of this is to say - faster access to insights from even your largest data sets. Write SQL for your application, or dashboard, and easily deploy to any form factor. For example, reports written to work with the IBM Integrated Analytics System can seamlessly work against data stored in Db2 Warehouse on Cloud or Db2 Warehouse. Nearly all of your Netezza and Oracle workloads will move seamlessly over to Db2 Warehouse on Cloud. For the select few edge cases, we offer migration services and free tooling to help you make a smooth transition. Db2 Warehouse on Cloud comes packed with a suite of Netezza-like in-database analytics tools so you can run your analytics jobs wherever your data resides. Algorithms include linear regression, decision tree clustering, k-means clustering, and ESRI-compatible geospatial extensions. Schedule backups timed around based on your business requirements, and retain up to 7 backups that can be used to quickly restore your cloud data warehouse if the need arises. For clients who would like to restrict access to their data, Db2 Warehouse on Cloud can be deployed on an isolated network that is accessible through a secure Virtual Private Network (VPN).